My bento posting order is in a bit of disarray since to meet round-up deadlines, I had to prioritize posting the previous two bento lunches for the Lasang Pinoy round up. Anyway, I’ll probably be able to get it all straightened out in a couple of posts. For now, ignore the dates and just enjoy the bento instead. Reheat and go! 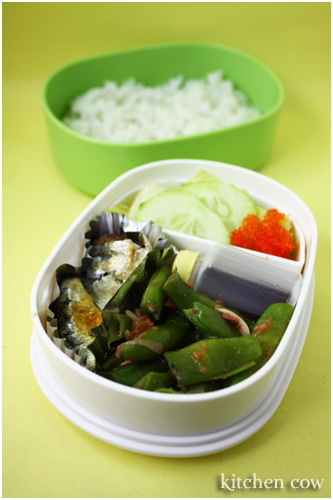 I simply reheated our dinner’s leftovers, Filipino-styled sautÃ©ed green beans, and dumped it straight to my bento box. SautÃ©ed green beans, or more appropriately, Ginisang Bitsuelas was always something I hated as a kid. Oh, I’d eat a strand or two when forced to eat my veggies but that was it. Age has taught me a finer appreciation of vegetables though, and something as simple as green beans sautÃ©ed in a little pork and bagoong (fermented shrimp paste) is now a welcome dish. To go with it, I grabbed some Spanish-style sardines from a bottle in the fridge. I have no idea about its veracity as a Spanish foodstuff (someone shed light on this?) but hey, the bottle says it’s Spanish-style so that’s what I’ll call it. To add something refreshing to the mix, I packed a small salad with iceberg lettuce, cucumber and a little ebiko (shrimp roe), to be drizzled with a ready-made soy-based dressing that was laced with shiso (perilla). Finally, I packed some steamed Jasmine rice to go with the whole thing. Simple, yummy and best of all, almost no cooking needed! ooo looks yummy esp the green beans! maybe i should try it hmm….o yeah i’ve been lurking around (not a stalker) your blog for a while but never commented hehehe ^_^’… just wnat to say love your blog! Mine isn’t exactly Bento, but I had fun pnutitg it together anyway. Thanks for your comment on my blog and directing me over to these great ideas! I’m a bit of a lurker on this site as well. I do love your bentos, but had to comment on the sardines. Yes Spaniards love them. For breakfast, brunch…whatever. They’re so a part of my diet and so many Spaniards. The Canaries are where a LOT of the sardines in the world come from. YUM! Excuse me, but Spaniards never eat sardines at breakfast. For lunch and dinner, yes. If sardines are fresh, it’s very typical to eat them grilled or spit-roast. It’s very, very common canned sardines (with oil) too. (I’m Spanish, so sorry for my English).